Our custom-designed banners make a BIG impression! Printed vinyl banners are an effective, economical sign solution for interior or exterior signage for your Rochester business to advertise. Our banners are printed with UV resistant ink and come with grommets for hanging. Additional options for banners include: edge hems, pole pockets, and matte or gloss UV resistant laminate. We offer full color 13oz. 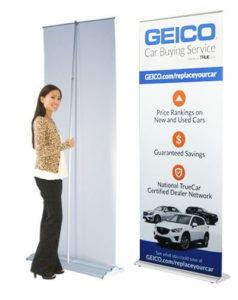 printed banners at custom sizes, based on increments of 6-inches. Standard sizes business have us print for them include: 4×3, 6×3, 8×4, and 10×5. 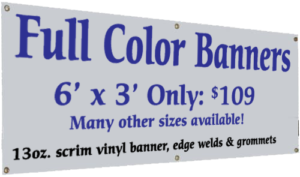 Our most popular banner is our 6ft x 3ft vinyl banner that we currently have on special for $110, and includes design and grommets for hanging. Our experienced design staff can take your concept, use your existing logo or artwork and create a stunning, professional printed banner for your business. We design banner for corporate, retail, service, trade show, grand openings, political campaigns, parades, and other uses for Rochester businesses. With our creativity and marketing experience, you can feel confident we’ll create a professional display for your business that drives your message home to your audience. Whether you need a special banner made to jump out and advertise a big splash of a message or are looking to have a banner that’s theme blends in with your existing marketing materials and reinforces your brand image, we’re your trusted team to get the job done. We know branding and are skilled at all the latest design applications, file formats, and preparing artwork for wide format printing, which is essential to having a professional-looking banner made. Retractable banner stands deliver an eye-catching message in a vertical banner orientation, with the convenience of the banner’s ability to retract into the bottom banner base for easy transporting to trade shows, or simply to use as an attention-grabbing sign in your showroom, hallway, entrance, or waiting room.